The European Commission Food and Veterinary Office (FVO) find serious violations during inspections conducted in November and December of 2010 of EU regulated plants in Mexico slaughtering horses for human consumption. There are numerous plants slaughtering horses for human consumption in Mexico, only five of which are EU regulated. FVO inspectors visited these plants plus three collecting centers and one US export pen for slaughter bound horses. The FVO objective was to verify that EU requirements for importing horse meat for human consumption into Europe are being followed. Two out of five establishments failed to meet EU requirements relating to slaughter hygiene and water quality. Additionally, there were non-traceable carcasses, a number of which were in contact with EU eligible horse meat. No export certificates will be issued until these issues are satisfactorily resolved. 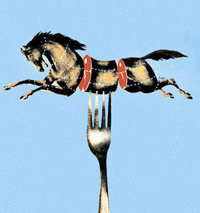 Random samples taken from horse meat processed in 2008, 2009 and 2010 tested positive for EU prohibited drug residues. Sworn statements made by horse owners on veterinary medical treatment histories were not authenticated and proven false, including cases of positive results for EU prohibited drug residues. From January and October 2010, of the 62,560 US horses shipped to slaughter 5,336 were rejected at the border due to advanced pregnancy, health problems or injuries. In a visit to one US export pen, 12 of the 30 horses held there were rejected. We urge the FVO to conduct similar inspections in Canada where they are certain to find similar results, and ban the import of all horse meat from North American and Australian horse slaughter plants. If anything turns my stomach that sure does………………. Hm. After reading the actual report, I would not eat horsemeat from Mexico even if I were so inclined. Tracking compliance procedures are not in place. Horsemeat is being tested for drug and parasite residues AFTER it is stamped approved for export and there is no written procedure to release it. Oddly, there are a number of places where, immediately after the documentation of a serious problem, the conclusion is that the area is generally in line with EU requirements….suggesting that a different person wrote the conclusion section, and with different motives. The other shocking thing is that over 1/3 (almost half) of horses at US collection centers were rejected WHEN the EU folks were actually present. Rejection reasons include injury, illness, or advanced pregnancy. In this report, the US apparently comes off even worse than Mexico. Only spot check inspections are done on horse meat. Who knows how many tonnes of adulterated horse meat potentially cancerous to humans have been exported to Europe, Japan et al over the years. They eat horse meat raw in Japan. Very glad to hear the EU is starting inspections. The Europeans deserve protection and hopefully the inspections will improve conditions for the horses. However the number of horses rejected at the border is shocking and suggests that the horses are in terrible shape by the time they get there. We need to continue to focus on minimum transport standards and the availability of humane euthanasia and rendering. Yes! It’s way past time for the EU to take some real action. Let’s get these people here in Canada too!!!!!!! The sooner the better.